If you haven’t been to Northern Spain, you don’t know what you’re missing. While I loved the endless beaches and coastlines, the medieval villages and historic centres in towns and cities were also a highlight of my visit. While these are my favourite medieval villages in northern Spain, I’m sure there are others I haven’t discovered. Unlike the famous villages of Cinque Terre in Italy, I had never heard of any of these villages. That’s in part what makes them so special. Go now, and discover them before everyone else does. Keep reading to check out my favourite villages and historic centres in Basque Country, Cantabria, Asturias and Galicia, also known as Green Spain. Hondarribia is the most beautiful town in Basque Country. This lovely town is known as the most beautiful in Basque Country. Within minutes, I could see why. While wandering through the Old Town, surrounded by a still-standing fortified wall, it’s easy to think you have slipped back in time. Besides the Old Town, Hondarribia also has a flourishing culinary scene. It’s so good that it’s attracting chefs from around Spain. There’s a wide choice of restaurants making it one of the best places to experience Basque gastronomy. Villa Magalean Hotel & Spa – A luxury boutique hotel with a Spa, situated in a charming villa on the edge of the historic district of Hondarribia. In it you enjoy a refined décor. Hotel Jaizkibel – This property is only 7 minutes walk from the beach. It is an elegant and modern hotel in an exclusive residential area of Hondarribia with views of Jaizkibel Mountain. Hotel Obispo – This property is 11 minutes walk from the beach. This former palace dating back to 14th-15th century is located in historic Hondarribia, enjoying views over the river Bidasoa and to France. See more accommodation options in Hondarribia. Boats take visitors between Pasai Donibane and Pasai San Pedro. The Old Town of Pasai Donibane is a single cobblestone street that starts in the Bizkaia District. It continues on to Alabortza Cove. You’ll pass houses dating back to the 16th century and find a cozy cafe with views of the cove. You can also take a really short boat ride to Pasai San Pedro to reach Albaola, a sea factory of the Basques. Here, you can learn all about whaling in Basque Country. Basque sailors were famous for their whaling skills going as far as Canada (my home country). It’s worth a side trip if you’re in the area. Travel tip: Albaola is closed on Mondays. It’s also a good place to watch how locals revel in the simple pleasures. Like cooling off with a swim. It reminds us that on a hot day, nothing is more refreshing than a cool dip! See more accommodation options in Pasai San Pedro. Getaria is sandwiched between two gorgeous beaches. This fishing village on the Urola Coast has beaches on either side. I really enjoyed my visit to this village. And could definitely have spent longer here. Fashionistas will want to visit the Cristóbal Balenciaga Museum. Getaria is the birthplace of the famed designer. See more accommodation options in Getaria. Mutriku is a town in Basque Country that dates back to the 13th century. Dating back to the 13th century, Mutrkiku is an interesting place to wander through the narrow streets and check out architecture. Of special note is the Galdona Palace. Also, keep your eye open for houses with their own unique coats of arms. Hotel Arbe – This is an Adults Only is a modern and well-equipped hotel in an unbeatable location overlooking the Bay of Arbe on the Guipuzcoana coast. The hotel has an impressive outdoor pool, set in a peaceful setting. Hotel Zumalabe – This is a small boutique hotel with only 6 rooms, each with either a terrace or large windows. It only takes 6 minutes on foot to get to the beach. See more accommodation options in Mutriku. At first glance, you’ll notice how modern Castro Urdiales is. Upon closer glance, you’ll find that it still has a medieval historic centre and a Gothic church. Both are worth exploring. When the weather is nice, watch, or join, local daredevils jumping off a bridge into a sheltered enclave. Sercotel Las Rocas – It provides ideal accommodation for those visiting the Green Coast. The hotel blends a tranquil location and traditional service with modern technology for a comfortable stay. One of its most impressive features is the restaurant. Hotel La Ronda – The hotel is located in Castro Urdiales main shopping street and only 10 minutes’ walk from the beach. The hotel has a modern decoration with a minimalist and traditional touch, that combines perfectly with the pebbled streets around the hotel. See more accommodation options in Castro Urdiales. Walking along the cobblestone streets to St. Juliana. Santillana del Mar is one of the best preserved medieval towns in Cantabria, Spain! No wonder that the village centre is a National Monument. It’s on the North Camino route and the Santa Juliana Church is a popular spot for pilgrims. I loved this place! It was easily one of my two favourite villages in northern Spain! La Casa del Organista – The hotel is housed in a traditional, mountain property dating from the 18th century. The original decor has been kept – with wooden floors and antique furniture. Posada La Casona de Los Güelitos Opens in new window – This is a typical country inn, with stone walls and wood beams. The beaches of the Costa Verde are just a short drive from Los Güelitos. The famous Altamira Caves are also nearby. Hotel Colonial de Santillana – Is set on a renovated old building, decorated from antiques collected through travels from all corners of the world. It only has fifteen rooms to be able to offer a more personalized service. See more accommodation options in Santillana del Mar. Pontifical University in Comillas. Photo by Duncan Rhodes. This seaside town had me saying WOW upon entering. Of note are the old buildings of Pontifical University, now relocated in Madrid. This is the finest architecture in town. That’s saying a lot for a place that’s also home to El Capricho., It’s one of Gaudi’s few works outside of Barcelona. While I stayed near Comillas, I, unfortunately, didn’t spend more time in the town itself. Duncan of Urban Travel Blog did, however. He declared it his favourite place in Cantabria. La Solana Montañesa – This property is 7 minutes walk from the beach. Posada Rural La Solana Montañesa is 150 m from the centre of Comillas, on Cantabria’s beautiful Green Coast. It offers views of Gaudí’s El Capricho and the Sobrellano Palace. La Montañesuca – This tiny hotel offers four double rooms and a classic-style dècor. The inn is only a 10-minute walk from the beach in Comillas and on a centric location within the villa. Hotel Josein – Each room here has direct views of the Cantabrian coast and Comillas Beach as it is only a few steps away. Plus, children under 10 years stay for free when using existing bedding. See more accommodation options in Comillas. Surrounded by the Cantabrian mountains, Cicera’s 68 inhabitants live the peaceful life. While I didn’t count, it’s quite possible that the residents are outnumbered by cats. You will pass it if you’re hiking the Camino Lebaniego. There’s a restaurant/bar where you can refuel. El Molino de Cicera – Situated in the Peñarrubia Valley, this early 20th-century Colonial-style building offers fully-equipped rustic apartments, with spectacular views of the Picos de Europa mountains. See more accommodation options in Cicera. Llanes is a medieval fishing town. Llanes is a medieval fishing town with a port that’s still active today. It played an important part in the whale hunt. Fishermen used to stand on guard and watch for smoke signals from other townsmen. Once the smoke signal was observed, all the fishermen would go out and join them in smaller boats with their harpoons. Llanes is also famous for its folklore and fiestas! In summer alone there are 4 notable festivals; Nuestra Señora del Conceyu, which celebrates the patron saint of the town on August 15th. Furthermore, there are three additional fiestas: La Magdalena on July 22nd, San Roque on August 16th, and La Guía on September 8th. These fiestas have a long and well-known rivalry. Each year they try to outdo the others. The result is a summer of incredible festivals for both locals and tourists alike! Don Paco – This beautiful hotel is set in a restored convent dating from the 17th century, just off Sablón beach in the pretty village of Llanes and is only 4 minutes walk from the beach. Gran Hotel Paraiso – A 3-star classical hotel just 300 m from the centre of Llanes and the sea. It offers hotel rooms and apartments. Hotel La Arquera – The hotel is in a country-style house, restored and transformed into a traditional eastern Asturias villa. Refurbishment and expansion has created a hotel with 13 rooms that accommodate between 2 and 4 people each. See more accommodation options in Llanes. Oviedo is the capital of Asturias. Despite not being a village, I’ve included Oviedo, the capital of Asturias. It has a unique history. In the 8th century, it was the capital of the Kingdom of Asturias. Centuries later, it still retains its medieval flair in the historic quarter. Of particular note is Oviedo Cathedral, but unfortunately, I arrived too late to visit. Exe Hotel El Magistral – This cozy, modern hotel blends a superb location in central Oviedo, just yards from the Cathedral and the city’s shopping centre. Hotel Fruela – This is a modern and elegant hotel with 28 rooms but still with a boutique style. Museum of Fine Arts of Asturias is 300 m from Hotel Fruela, and Campoamor Theater is 300 m from the property. Ayre Hotel Alfonso II – A boutique hotel with an urban design located in a quiet residential area. It only has 19 rooms distributed over 3 stories with a colonial style. See more accommodation options in Oviedo. Cudillero, one of the prettiest fishing villages in Northern Spain. This is a tie with Santillana del Mar for my favourite medieval village in northern Spain. Its reputation precedes itself for being one of the most beautiful fishing villages in all of Spain. But what I really loved about it, besides the incredible views, were how friendly the locals were. My limited Spanish consists of Más vino por favor (more wine please). Fortunately, I was with some Spanish friends who were able to translate. I had the pleasure of meeting a 98-year-old lady. She said that she never tires of the view from her window after all these years. She had an aurora of peacefulness. And was the kind of person that you feel more still just from being around her. I also loved the self-guided tour. You follow the blue fish signs painted on the ground. Be warned, you will feel the burn. Cudillero is built on a hill. This village was also exceptional for cats. They all appeared to be well fed. Another plus for Cudillero! One of the many cats seen in the fishing village of Cudillero. Another one of the many cats seen in the fishing village of Cudillero. Casona de La Paca – Is a hotel located on a 20 room house from the 19th century. The common areas still resemble those of an ancient Casona. La Casona de Pío – This property is located right in the middle of the historic centre of Cudillero, on a building that was once a large factory. It has 11 beautiful rooms. Hotel Rural Aguilar – Is right on Camoni de Santiago, surrounded by forests and offers amazing sea views. There are terraces on each room. See more accommodation options in Cudillero. 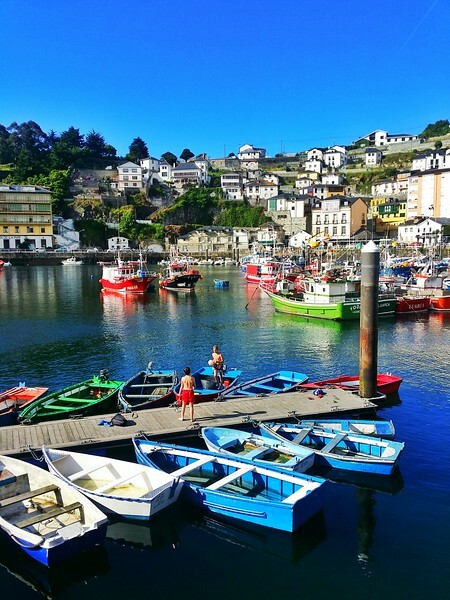 Luarca is known to have one of the most beautiful harbours in all of Spain. The highlight of Luarca is its harbour. It’s one the most beautiful in all of Spain. I really enjoyed walking around the fishing port. The winding narrow streets of the Old Town are also worth exploring. Hotel Rural 3 Cabos – This is a combination of modern and traditional Asturian Architecture in just one hotel. This project was a complicated renovation of ruins from a big house more than a century old. The hotel also provides free use of bicycles. Hotel Rural Cabo Busto – The hotel is a beautiful property with large gardens and rooms with great views of local grounds. Finca Portizuelo – This property is a 1-minute walk from the beach. Showcasing a sun terrace and views of the garden. Certain units feature a sitting area to relax in after a busy day but they all have a clean and fresh decor. See more accommodation options in Luarca. The name of this town translates to Monks. That’s rather fitting since the main highlight is the Cistercian Monastery of Santa Maria de Sobrado dos Monxes. It dates back to the 10th century. This UNESCO World Heritage Site is an important stop on the Camino de Santiago. Hotel Rural Pescadores – Showcasing a terrace and views of the mountains, Hotel Rural Pescadores is located in Sobrado in the region of Castilla y Leon, just 20.9 km from Ponferrada. See more accommodation options in Sobrado dos Monxes. Santiago is far from being a village. However, its UNESCO designated Old Town is one of the most beautiful urban areas you’ll find anywhere on the planet! Architectural styles range from Romanesque to Gothic to Baroque giving it a unique flair. You’ll find many of the oldest buildings around the Santiago de Compostela Cathedral. The cathedral is also the finish point of the 780km long St. James Way, also known as the Camino, of which I just did the last 112 km. You’ll find the remains of St. James himself here. It’s worth doing a tour of Museum and Cathedral of Santiago de Compostela, even if you’re not a tour person since there’s so much fascinating history that you miss if you just go on your own. I did a tour and really enjoyed it and I’m not usually much for cathedral tours. I also highly recommend heading to the rooftop. It’s available via tours only. You’ll get an incredible view over Santiago and beyond! Hotel Praza Quintana – This is a stylish hotel located in the heart of the historical centre of Santiago de Compostela, a 3-minute walk from Santiago de Compostela Cathedral, Plaza de las Platerías. Hotel Atalaia B&B – The hotel is housed on an old stone building and its name is a homage to a Atalaia tower that once protecte the city. It has 10 beautifully furnished rooms. A Quinta Da Auga Hotel Spa Relais & Chateaux – Set in a renovated 18th-century building, A Quinta Da Auga is a luxury eco-hotel located just outside central Santiago de Compostela. The beautiful property has gardens, fountains and a river. See more accommodation options in Santiago de Compostela. Disclosure: Many thanks to the Spain Tourism Board for the UK and The Travel Mob for making my visit possible. As always, all opinions expressed are my own. Previous postElk Island National Park: One of the Best Places to See Bison! I love these small out of the way villages in Spain. We live in the south but have also discovered some amazing small places around here. We spent a few days in Oviedo last fall and fell in love with the city and Asturias. @Darlene Me too! Glad that you have discovered northern Spain and Oviedo, such a great place. Reallly beautiful houses, but the boats may be even more picturesque. Great Post! Thanks for sharing. Loved how you share your travel story! And, the pictures are simply breathtaking. Awesome blog! Glad I found you guys today! Cheers and enjoy the rest of the week! Hi, such a great place and awesome post! Very interesting. I love reading about and experiencing northern Spain and Oviedo place. @John You've done very well! There's so much to discover in Northern Spain. Lovely article! I've visited Cantabria and wanted so badly to make it to Asturias, but time didn't allow! I'll definitely be back, Spain has a special place in my heart because I taught English down in Andalucia for a year :) My fave village is in Catalunya, nearby to Girona. It's called Besalu and it's absolutely incredible! Feels like you've stepped back in time and I didn't want to leave! @Val - I loved Cantabria. I've also been to Besalu and agree, it's incredible. Hi, Your post is great! Wondering if you could help with some trip planning advice? I'm taking my daughter to Spain in July for her High School graduation present. She has taken 4 years of Spanish and wants to practice it on our trip. Is that possible in the Basque area? We will be doing a home exchange for about 10 days, so we'll have a base to explore from. Any suggestions on where to base ourselves? We'd love to explore all the areas you've listed but I don't thing that's possible in only 10 days. We love the idea of staying in a medieval village or small town but not a sleepy one. Someplace that has enough for us to do during the day and at night especially if we decide to stay put for a few days. Would love any suggestions you might have. We can travel either by car or train/bus. Thanks!